Sujata Sundaresan sent us the following story. It was a privilege and a pleasure to have teamed up with Pratham Books in their initiative of 1 day, 1 book, 100 story telling sessions of the story book “Susheela’s Kolam” on the occasion of International Literacy Day. which were later displayed so that the parents also got an opportunity to see them. The Story session was also conducted for our outreach programme-‘Shiksha’. The story was narrated in Hindi. 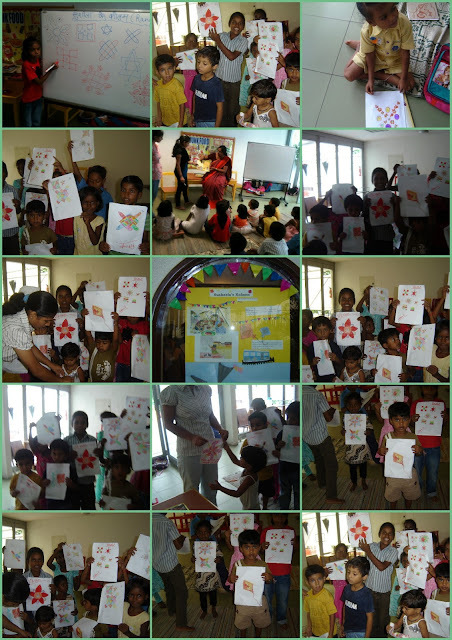 Children drew beautiful Kolams. I would like to congratulate Pratham Books on such a brilliant initiative and we are proud to have been a part of this endeavour. Thank you Modern Monterssori International Pre-school Centre for spreading the joy of reading and a big thank you to Sujata for sending us this story!